Charitable giving is ingrained in our culture. Americans as a percentage of gross domestic product give more than any other country. And as a result of this charitable inclination, the Chronicle of Philanthropy reports the United States has raised more than $895 million in response to the recent devastation in Haiti. But how can we know that we are giving smartly? That our donation is being used in the best possible way and not being wasted on something we did not intend? How can giving actually help you, outside of the warm feeling you get? These five tips to charitable giving will get you on your way to smarter, more beneficial donating. 1. Create a short list. Start with identifying a few organizations that are aligned with your beliefs or issues. There are so many organizations out there, starting with a few of these top-of-mind groups will get you on your way. 2. Know to whom you are giving. Discuss your list of organizations with your family and friends. Check out the organization's website. Read up on what they are doing in your community. If they have an e-newsletter, subscribe to it. Perform in-depth research using sites like Charity Navigator or GuideStar. The Better Business Bureau is also a great tool for determining the legitimacy of a particular charity. These sites provide information on revenue, expenses, and even how much they pay their top executives. 3. Giving is a tax deduction. Most charitable giving is tax deductible. Yearly giving is a great way to cut your taxable income. If you give to a charity that supports Haiti in 2010, it is tax-deductible for 2009. Remember to keep any receipts or invoices. 4. Watch out for red flags. Be mindful of fly by night organizations or groups that spend much more than they bring in. All non-profit organizations have to file a Form 990 with the Internal Revenue Service. This publicly available document can be used to determine financial health. 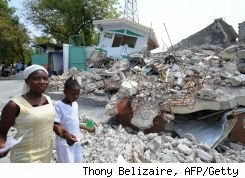 Many fraudulent groups have sprung up in the wake of the disaster in Haiti. A lack of filing history or poor financial history are red flags that should not be ignored. 5. Is this organization a good fit for me? It's is an important question. The group should clearly convey that what it does is important (we all agree that curing cancer is important), but how they do it should actually makes sense. Their mission and your goals should be in line with one another. You want the organization to succeed and feel good about your gift.